If you are searching for a fast external storage device you may be interested in the new Fledging Shell, being marketed as the “world’s fastest external storage device compatible with all machines”. The Shell is capable of transferring 15GB of data in just 16 seconds averaging at 1GB per second. Offering up to “Up to 10x speed of external HDD and 2x speed of portable SSDs says its creators – (Tested on an Apple MacBook Pro 13-inch 2017. Only devices with USB 3.1 10Gbps or Thunderbolt 3 port can achieve this speed. Normal USB 3.0 5Gbps ports are capped at 500 MB/s in read and write speed. To ensure the best performance please check your devices specifications). The SDD external storage is the world’s first portable NVMe SSD compatible with USB say it’s creators who have launched the device via Kickstarter and already blasted past their required pledge goal with still 28 days remaining on the campaign. Watch the demonstration video below to learn more about the devices compatibility, speed, design and features. With early bird pledges available from $120 for the 256GB version, the team hopes to start shipping to worldwide backers in a couple of months time during December 2018, if all goes smoothly with production. 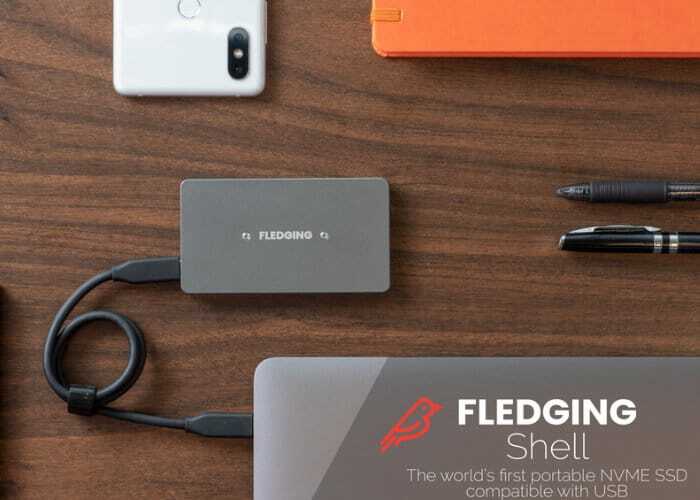 For more details and full specifications jump over to the official Fledging Shell SSD Kickstarter campaign page by following the link below.